Just wanted to share this tip I came up with myself in college (although I’m sure someone in the world has thought of it). 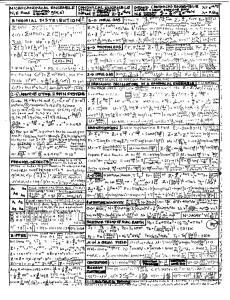 It is intended for use in engineering/math type classes with limited or no use of a cheat sheet. Let’s call it the short term memory cheat sheet. Step 1: Make a 1 page cheat sheet of equations/material you need to remember. It should only be material you don’t remember (no easy equations like F = ma), and it should be sectioned in a grid of some kind. Each time you review the sheet, try to “place” the items in their grid space, and remember them spatially. Step 2: Read over the sheet a few times after writing it. Go to sleep. Step 3: Review the sheet the morning of the test. Step 4: Have the sheet on your desk, trying to memorize as much as you can while waiting for the professor to hand out the tests. Up until the professor tells you to put everything away. Step 5: This is important: when you get your test, turn it over and draw the same grid you had on the cheat sheet you just put away in your backpack. This helps with visualization. If you get scrap paper you can use one of those. If your professor prints double sided and you have no clean sheet of paper, get creative. Step 6: Fill in as much as you can remember. Speed is important as you’re relying on your short term memory. Try to visualize the sections of the grid, and what each contains. Regurgitate as much as you can as fast as you can, before reading anything. Remember every minute you’re writing down your cheat sheet is a minute you lose to take the actual test. Boom, now you have a cheat sheet for a test that does not allow any cheat sheet! Feel free to link to this page if your professor thinks you cheated. Then tell them, with the internet, memorization is getting pretty pointless. Bonus tip: When you do get a cheat sheet, if you write in one direction with red pen and then turn the paper 90° and write in blue pen, you can fit twice as many notes.